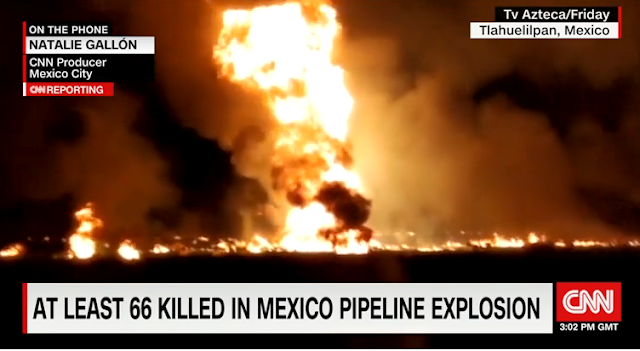 A damage gasoline pipeline exploded Friday evening at central Mexico, leaving atleast 73 people were killed and dozens injured. Hidalgo state governor announced Omar Fayad announced the incident. He said that victims were already given medical attentions and the investigation in on going. The blast recounts 74 people suffered from injury which occurred near Tlahuelilpan, a town of 20, 2000 people about an hour's drive north of Mexico City. Soldiers guarded the devastated areas, investigators are working to investigate the cause of the deadly blast. Video taken in the aftermath showed people screaming fleeing the scene as fire burst out and lights up the night sky. Residents in the immediate vicinity of the pipeline, which runs from the cities of Tuxupan to Tula, have been evacuated. The tragedy comes during the gas stations in several Mexican places have run out dry for a couple of weeks. The company have shutdown key pipelines in an effort to stopped on fuel theft, a problem that cost Mexican government an estimated US$3 billion in 2017. Authorities have blamed the explosion to fuel theft which recorded in 2010, a pipeline blew up in the state of Puebla, leaving 28 people dead.